The above picture of Jimmy Martin, King of Bluegrass, & The Sunny Mountain Boys was taken on July 26,1997 inside the Cozy Cove. 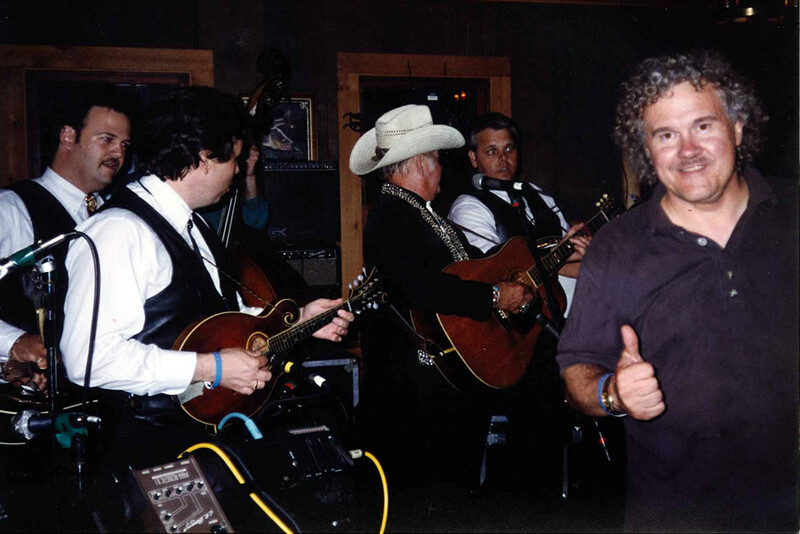 Festival founder, Jerry Florian, is shown getting caught up in the excitement of the performance while giving a thumbs up. He offers this message: The signature of the Midsummer Bluegrass Music Festival are the sessions like this one with Jimmy Martin within the pine-paneled walls of the 1930's vintage Cozy Cove. If I speak of listening to Ralph Stanley & The Clinch Mountain Boys (July 31, 1999) crooning "Rank Stranger" a cappella as a peak experience, I might be trivializing Larry Sparks & The Lonesome Ramblers (July 27, 2003) singing the John Deere Tractor tune. When Fiddle virtuoso Bobby Hicks' rendition of Estrellita reverberated the Cozy Cove walls (July 25, 2015) and the existential theme behind the Rabbit Song by troubadour Allen Mills of Lost & Found brought thought and a smile about passages in life inside the Cozy Cove (August 5, 2016), the musical brilliance of the moment was obvious. One ultimate question to be answered as this year's Cozy Cove sessions unfold is: Which Dale Ann Bradley song will resonate with you the most? The Cozy Cove sessions have time and again provided pleasing inspirations for generating a second 25 years of Bluegrass Shows here in Manitowish Waters. But then the paradox is that I believe Bluegrass Music can best be understood under the natural conditions of the open sky. I look forward to sharing those moments with you also. The Midsummer Bluegrass Music Festival is comprised of volunteers and Bluegrass enthusiasts from Manitowish Waters and surrounding areas. The Festival was created in 1989 and is the longest-running, continuous annual Bluegrass Festival in Wisconsin. The MidSummer Bluegrass Festival expresses gratitude toward Tony Uecke for his volunteer work over the past 20 plus years. If any patrons are amazed as to how authentically good our vegan red beans & rice are at the Fest, thanks goes to Tony's training as a New Orleans based cook. This picture of Tony captures a rare time of solitude in midst of years of responsibilities being a soccer Dad, marriage partner, town supervisor and naturalist extraordinaire. 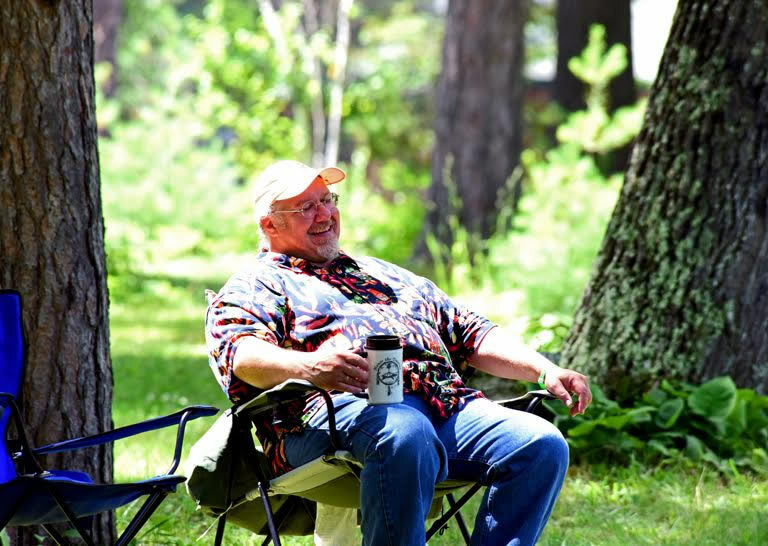 The contentment in Tony's leisurely pose speaks to his joy of having time for reflection as he listens to the sweet sounds of Bluegrass Music in the great outdoors of the Northwoods. While Tony readily admits to being intrinsically motivated by social caring and altruism, he advises: Volunteer only if it adds to fulfilling your Midsummer Bluegrass experience! Please call the festival's Volunteer Coordinator (715) 543-2166 if you are interested in assuming a 2 or 4 hour shift. 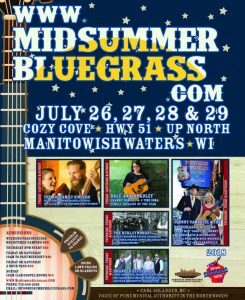 The Midsummer Bluegrass Music Festival utilizes and highlights the abundant music, art, history, and natural assets of the Manitowish Waters area and surrounding region to provide a distinct musical and artistic experience to community members and visitors of all ages and demographics. Midsummer Bluegrass Music Festival provides a high quality music and art festival experience in a natural and sustainable community setting. The festival expands local art initiatives by showcasing local and regional musical talent, offering educational artistic opportunities for all ages, and demonstrating the skill and knowledge of a diverse group of talented artisans. Midsummer Bluegrass Music Festival builds on the distinct musical heritage of the Manitowish Waters area and leverages the wide array of strong community assets that are available. What kind of music does the Midsummer Bluegrass Music Festival have? This outdoor music festival features live music by artists and bands from all over the nation. Hear lively, innovative sounds of blues, rock, country, Americana and more. With a wide variety of bands, you'll definitely find some new favorites! Copyright 2019 Midsummer Bluegrass Festival. All Rights Reserved.